...I don't like my daisies in the big blocks. The centres are a right old mess, although they don't look too bad in the photo. Maybe I'm just too close to them and need to step back a bit. I'm leaving it alone for this evening, and I'll see how I feel tomorrow. I suspect that it will be back to the drawing board! I don't know I think they look pretty darn good! The daisies look Great! to me. I also love the colors of your quilt. Well after those other comments about pulling it out... I still say give it a bit of time. 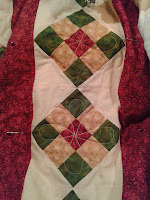 I think you're being to hard on yourself and when you start quilting in the other areas you wont feel the same. Have you given any thought to how you will quilt the cream and the red yet? One thing that does come to mind, is remember that daisies are organic. Some have bent petals and there is always a breeze blowing when they are in bloom. What if you made a line up and back through the petals say from the center to about the broadest point on the flower and then back. Maybe lines maybe small inner loops so you don't have to worry about trying to trace back on your work, you could test on your test piece, that would make the flowers pop and give them a 3D effect. 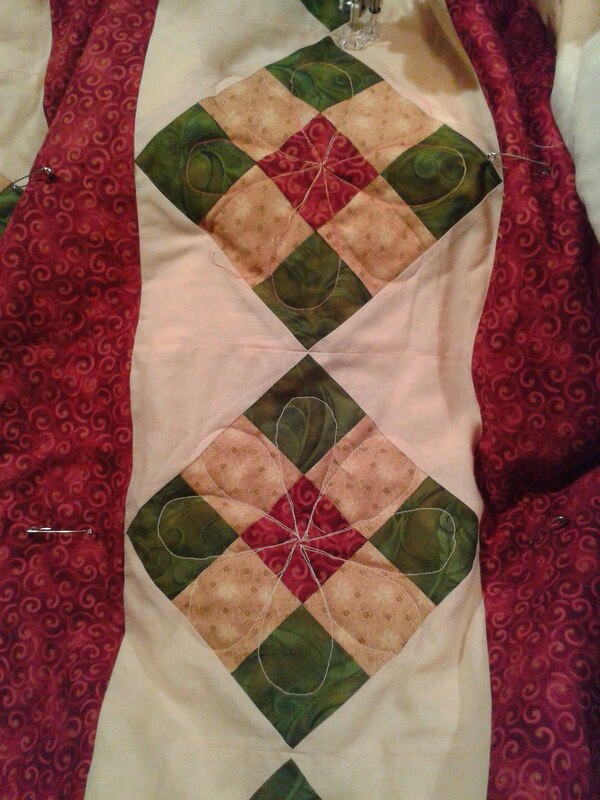 It would also thicken the quilting out from the center making the overall look more uniform. But if you hate it, you hate it. I like the daisies! I do know, though, that like the others have said, that if you aren't happy with them, out they must go! It is horrible to have a quilt done and not like part of it! For all my moaning last week about Google, I do LOVE blogger - you've all been really helpful on this quilting conundrum, and I must say thank you!